Stuffed Pepper Meatball Soup is the perfect soup to take the winter chill off! Just like the title says, it's a soup with all the ingredients of a stuffed pepper in wonderful soup form! It'll have you craving a second bowl! Today, January 19th is National Soup Swap day! the entire month of January is National Soup month! So what better way to celebrate than to share/ swap soup recipes with some blogger friends of mine! 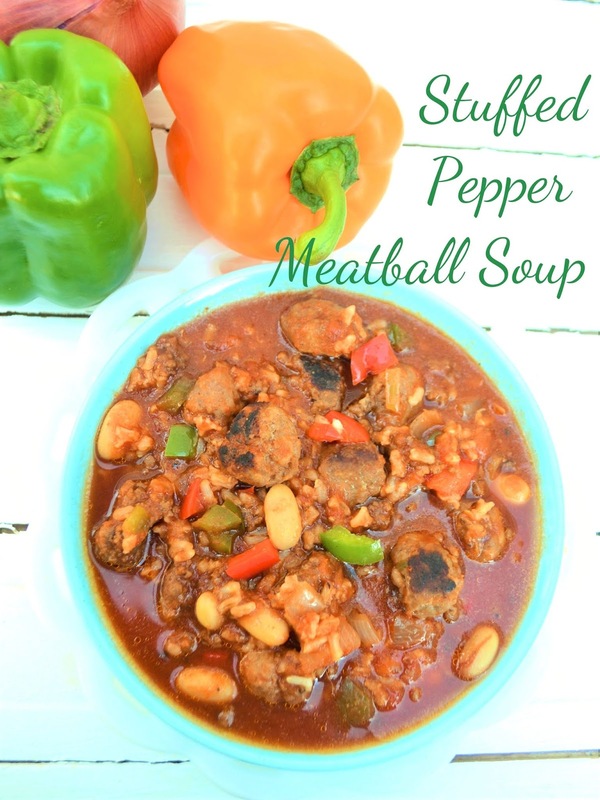 I am sharing this Stuffed Pepper Meatball Soup and below you'll see all the other soups we are sharing/swapping! If you've never heard of Stuffed Pepper Soup, it's actually quite popular, you'll find recipes all over the Internet. I came across it in the recipe section of my local paper, and clipped it out waiting on a great excuse to try it, and today was the perfect excuse! My family is so glad I did! The version I clipped used made from scratch meatballs, other recipes I looked up used plain ground hamburger. I modified my version to make my own style, and used my Soup Pantry staple: Mini Brat Meatballs for soup PLUS ground hamburger to make it even more hearty! I love using brat sausage and rolling tiny little meatballs for soup (remove casing) it adds instant flavor! By adding the additional hamburger I added just that extra touch of heartiness and it's more reminiscent of stuffed peppers also, so I keep that more traditional taste. With green and red bell peppers, rice and a rich broth and tomato base this soup just warms you body and soul! This soup is definitely going into my rotation of fall and winter soups! Remove casings from bratwurst sausages. Cut each sausage into 10 small slices. Roll each slice into mini meatballs. You should end up with 50 miniature meatballs approx. 3/4 inch in size. Cook meatballs in dutch oven or large pot over medium heat till browned on all sides and cooked nearly through. Remove from heat. Cook hamburger, onions, garlic, and peppers, in the same pot over medium heat, till meat is cooked through. Drain . Add meatballs back into pot. Stir in broth, tomatoes, Italian seasoning, and salt. Simmer on low 30 minutes, stirring occasionally. (I do this while I'm cooking up biscuits or cornbread) . Taste for salt. Here are some more great Soup Recipes to try! A very hearty soup for a cold wintry day! I cant wait to try this. Thanks. I haven't heard of this but it sure sounds delicious! I love taking foods and adapting them to soup! This is definitely going to be a winner in our house! Thanks for celebrating National Soup Swap Day with us! I love that this recipe has both the hamburger and bratwurst. Such a flavorful and delicious soup! i am drooling over this Stuffed Pepper Meatball Soup! i love that you used Bratwurst in your meatballs. Such a great layer of flavor it must add to them. The soup is hearty and full of flavor! This soup sounds really delicious -- I love all the colors and the addition of sausage, too. Yum! Using the bratwurst as meatballs is brilliant! I always buy a bunch of packages then cook them the same old way. Definitely need to try this! This sounds wonderful! I love that you added beans to your soup too!